Since it was built in 1906, Golf Club Crans-sur Sierre is regarded as one of the most beautiful courses in Europe. Situated on a plateau 1500 meters above sea level in the Alps, the course provides golfers with breathtaking views out towards Mont Blanc and the Matterhorn. Each year the European Tour's best players flock to the region to play in the prestigious Omega Masters and the fact it repeatedly hosts this event is a testament to sheer quality of the golf course. In 1995, the venue was given a revamp by the late great Seve Ballesteros and as a result has gone from strength to strength ever since. 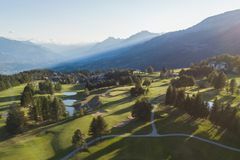 For those looking to play one of the most stunning golf courses in all of Europe then look no further than Golf Club Crans-sur Sierre. Founded in 1905, the site suffered considerable damage during both World Wars, but the 1948 design was sharpened up by Seve Ballesteros in 1995, and the course remains immensely popular. Playing at altitude is always interesting - the ball travels up to 15% further in the thin air - and the Ballesteros course is as picturesque as they come. In addition to spectacular views, the lay out of the golf course is equally excellent with each hole set up to test every facet of your game from big booming drives to touch on the greens. The pristine fairways glide over the naturally undulating terrain and as a result drastic run off areas are created meaning an emphasis is placed on accuracy both off the tee and in approach play. However, despite the fact the course is designed to provide a stern test for the best players among us, the course has been designed in such a way that when played from different tee boxes it is still accessible for the more social player. Just extraordinary. A Golfing experience that cannot be missed. Breath-taking.